Martian Lakes Linked to Ancient Habitable Environment? Groundwater circulation beneath a massive tectonic rift zone located along the flanks of some the solar system's largest volcanic plateaus resulted in the formation more than 3 billion years ago of some the deepest basins on Mars, according to a new paper by Planetary Science Institute Senior Scientist J. Alexis Palmero Rodriguez. These basins could have been episodically covered, perhaps during hundreds of millions of years, by lava and water lakes that were discharged from subsurface pressurized sources, Rodriguez writes in "Groundwater Flow Induced Collapse and Flooding in Noctis Labyrinthus, Mars" that appears in Planetary and Space Science. This shows an area on Mars that could possibly have harbored life. "The temperature ranges, presence of liquid water, and nutrient availability, which characterize known habitable environments on Earth, have higher chances of forming on Mars in areas of long-lived water and volcanic processes," Rodriguez said. "Existing salt deposits and sedimentary structures of possible emplacement within Martian paleo-lakes are of particular astrobiological importance when looking for past habitable areas on Mars. This is particularly true if the discharge of early Mars groundwater, perhaps liked to hydrothermal systems that were active for billions of years, contributed to the formation of the paleo-lakes, as it is proposed in this investigation." The detection of paleo-lake sites on Mars is particular challenging because under the planet's frigidly cold and thin atmosphere, their ponded water would have behaved differently than on Earth, he said. 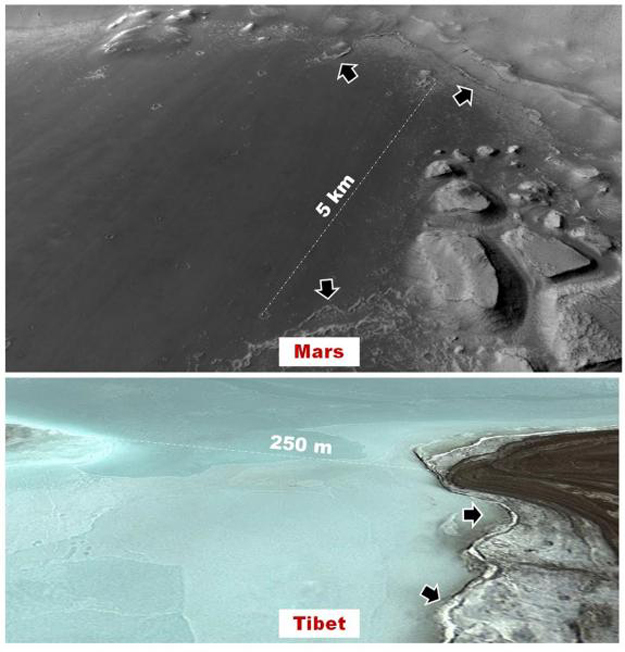 "In this research we propose a Tibetan region where high mountain lakes show unique sets of landforms that might explain some basin interior features in the studied region of Mars." In collaboration with the Chinese government, Rodriquez will visit the Tibetan region this coming summer to investigate their in-situ potential as astrobiological analog sites. These activities will not be funded by NASA. Visit http://www.psi.edu/news/alexisimage to see close-up views on the floors of a lava-covered basin on Mars, where shallow lakes could have formed within the last few tens of millions of years, and a proposed analog terrain high mountain lake in the Tibetan plateau. "Groundwater Flow Induced Collapse and Flooding in Noctis Labyrinthus, Mars," J. Alexis Palmero Rodriguez et al., 2016, Planetary and Space Science [http://www.sciencedirect.com/science/article/pii/S0032063315003815]. PSI Senior Scientist Cathy Weitz and Associate Research Scientist Thomas Platz are co-authors on the paper. The Planetary Science Institute is a private, nonprofit 501(c)(3) corporation dedicated to solar system exploration. It is headquartered in Tucson, Arizona, where it was founded in 1972. PSI scientists are involved in numerous NASA and international missions, the study of Mars and other planets, the Moon, asteroids, comets, interplanetary dust, impact physics, the origin of the solar system, extra-solar planet formation, dynamics, the rise of life, and other areas of research. They conduct fieldwork on all continents around the world. They also are actively involved in science education and public outreach through school programs, children's books, popular science books and art. PSI scientists are based in 22 states and the District of Columbia, and work from various locations around the world.